Driving south on the Carretera Austral you eventually reach the end of this amazingly spectacular road, at the small town of Villa O’Higgins, 550 km from Coyhaqui and 48°28 S (on a par with Washington, Ontario and much of central Europe). The scenery driving south is stunning all the way, with huge glaciers glistening above extensive forests. The Baker River was a highlight for me, having heard of it, but never been there before. Villa O’Higgins itself is a small town currently with few amenities, but watch this space. Just ten years ago El Chalten on the Argentinean side was very like this and now is a growing, lively tourist town. 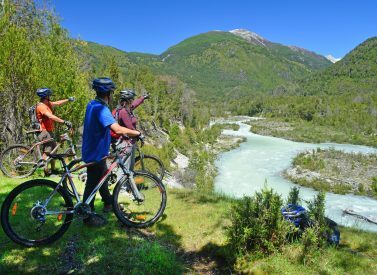 Villa O’Higgins does offer accommodation, camping and a couple of restaurants and is in a fabulous location with opportunities for trekking, biking, fishing in the vast enviable wilderness on its doorstep. It is well worth spending a few days here – and it is the end of the road, so the only way out is back the way you came or across the hills into Argentina. Some careful planning is required. We can help with that, just let us know if you prefer self-drive, or a driver/guide to get your there and we’ll put together an itinerary to suit. The Argentineans seem reluctant to open up the border to allow a flow of vehicular traffic, so currently crossing over can only be done on foot or by bike, through oe or other adventurous routes. It is mostly cyclists you see here, who’ve pedalled down from Puerto Montt, or further north. Firstly a short bus hop takes you to the port, a scenic 3 hour ferry crossing of Lago O’Higgins, overnight in a simple homestay then a (horse supported) 22 km hike through the forests during which you cross both borders, another ferry this time just 45 minutes across Lago del Desierto in Argentina, and finally an hour by bus to El Chalten. This is a remote wilderness area, with some of the most stunning ice and mountain scenery I have ever seen. 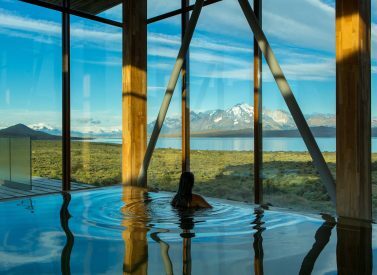 On the Chilean side you are treated to clear views of the mountain of O’Higgins and of several huge glaciers, and across the South Patagonia Ice Cap. As you near Argentina you have a magical view of Cero Torre and Mount Fitzroy flanked by the other granite spires of the massif. The walk is through southern beech forest, and we didn’t see anyone once we were off the boat. The overnight is at the home of a family that settled the area 2 generations ago. Their “farm” is 10,000 hectares of wilderness with 20horses and 200 cattle. A night in the family home gives just a small glimpse of life here which obviously requires a degree of self reliance unknown to most of the rest of us. This is a journey unlike any other I have experienced. I loved it and am looking forward to returning with some more days to spend exploring the trekking. If you are considering an off the beaten track adventure to Patagonia then do get in touch with us at Andean Trails and start planning your trip, whether this fabulous crossing from Villa O’Higgins in Chile to El Chalten in Argentina, or another…..